Tigh a' Bhaoghlach. (The Benbecula man's House) is a 3 bedroom self catering accommodation located between the townships of Trosairidh and Garrynamonie, at the southern tip of South Uist. It has recently been renovated to a high modern standard. The house is located on the edge of the moor, yet only 1 mile from the white sands of the machair. 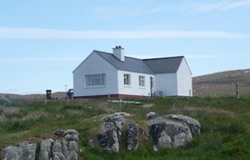 This self catering accommodation offers excellent views of the Atlantic Ocean and over to the Isle of Barra. If you fancy a leisurely stroll along the machair with its wild flowers and its white beach, head down through the small township of Garrynamoine for about a mile. Or if you are feeling a little more energetic, jump the fence and step straight into the moors and head up Easbhal, the hill next to the house. From the top you will be greeted with fantastic views of Eriskay, Barra and on good days Skye and Canna. Tigh A' Bhaolach has these walks all on its doorstep. The isle of South Uist and it's neighbouring islands of Eriskay, Benbecula and North Uist - all reached by causeway. Barra (where Whiskey Galore was filmed) can be reached by a short ferry crossing. The SS Politician that carried all that whiskey actually went aground on South Uist in the Sound of Eriskay, and the owner of the houses' father was an original participant of the "whiskey salvage". Take a trip to the museum to find out more about the island. Look out also, for the thatch cottages that are being renovated across the island. Kitchen: Modern fitted kitchen with stainless steel appliances and tiled floor. Includes microwave, fridge, washing machine. A separate larder fridge is located in the hall cupboard. Fully stocked kitchen including dining table and chairs, cutlery, glasses, plates, pans. Bathroom: Modern fitted bathroom with a clean and bright feel. Electric shower over the bath. Tiled floor and walls. Heated towel rail. Master Bedroom: Comfy double bed with pine bedside units, dressing table and wardrobe. Ssingle bedroom: Single bed with bedside unit and chest of drawers. Hall: Spacious hall with wooden flooring. Cupboards for linen, freezer and electrics. Linen: All linen and towels are provided.